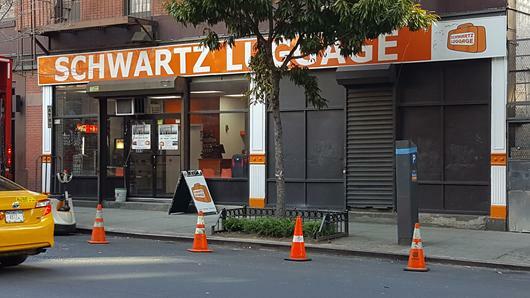 Schwartz Luggage & Storage NYC remains the one and only ground floor Luggage Storage facility in Manhattan top-rated #1 since 2004, offering luggage storage, new quality luggage, taxi service to all nyc airports, and more. Close to Penn Station but Serving all nyc. Open 24h. "Over 1.2 Million Luggage Stored Since 2004"
Looking for one of our many Luggage Storage Afiliates either in NYC, U.S. or International, or Looking to Become an Affiliate Please send us An E-Mail at schwartzhq@gmail.com thank you. Between 8th & 9th Ave. Cor 9th Ave.
NYC Luggage Storage in pictures.Click Below. We also offer monthly rates. FOR A SAFE SECURE AND PLEASANT LUGGAGE STORAGE EXPERIENCE... MAKE SURE ITS "SCHWARTZ" 100% SATISFACTION GUARANTEED. Please find all general info on this web page, you do NOT need to call customer service for reservations. 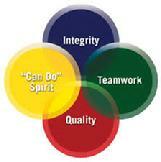 For all your comments or complaints please contact our General Manager Mr. Joe Stow either by e-mail or on his cell. Monthly Rate: $5 per day, (depending on size) per luggage. Open Everyday at 357 w 376th st included Major Holidays. After Hour Service available by reservation only please e-mail us or call. please read the "reviews page", or contact us by e-mail. From Penn Station: (5 min walk) walk out the 8th Ave exit. turn right to 36th st. turn left. From Port Authority: (5 min walk) walk out to 8th ave. turn right to 36th st. turn right. From Times square: (10 min walk) walk down to 8th ave. turn left to 36th st. turn right. From Grand Central: (15 min walk) walk down 42nd st to 8th Ave. as above. taxi fare is approximately $7 (recommended with luggage). From Empire State Building: (10 min walk) walk down 34th st to 8th ave. turn right to 36th st. turn left. From Ship Terminal: Taxi recommended, fare is approximately $6. By Subway: (3 min walk) the A.C.E. line stops at 8th ave. corner 35th st.
with discounts to, Museums, Sightseeing. also info, etc. Thanks for using Schwartz Travel Services. Midtown Manhattan Luggage Storage, Baggage Storage, Luggage Forwarding, Lockers, Coat Check, NYC Tiny Self Storage. Available Daily, Weekly, Monthly. We Sell Luggage. Close to NY Penn Station, NYC Port Authority Bus Terminal, Empire State Building, Madison Square Garden, Times Square, Javits Center, B&H Photo & Video, Grand Central Terminal, Cruise Ship Terminals, Sightseeing pick-up areas, Midtown Hotels, Museums, Restaurants, Shopping Areas and more. Short-term Luggage Storage or Long-Term Luggage Storage. We are Schwartz Travel Zone aka Schwartz Luggage Storage (SCHLUS). also providing Airport Trips from midtown manhattan to JFK Airport. Midtown Manhattan to LGA Airport. Midtown Manhattan to Newark International Airport. we share taxi so you pay less. we also sell new Luggage. Schwartz Luggage NYC. Sales. Shipping. Storage Organizing. Daily Storage Price: $7 - $10 each bag. $10 maximum per day per luggage. Monthly Luggage Storage / Lockers: $5 per day per Luggage or Locker... compared to others - Airports, Hotels etc - where you pay $12 to $16 per day for the same service (no monthly rates available), and we are conveniently located in the heart of Manhattan... WOW. For an extra charge, ($50 Minimum) we will pick-up and deliver your luggage at any midtown location . Contact us for details. Please find all general information on this web page, you do NOT need to call customer service for reservations. For all your comments or complaints please contact our General Manager Mr. Joe Black either by e-mail or on his cell. Just walk in - No reservations required. Why rent a storage room when all you need is Luggage Storage. Storage Price: approximately $8 to $10 (depending on size). per 24 hours. Monthly Rate: $3 to $5 a day, per luggage, box or locker. Midtown Manhattan Luggage Storage, Baggage Storage, Luggage Forwarding, Lockers, Coat Check, NYC Tiny Self Storage. Available Daily, Weekly, Monthly. We Sell Luggages. Close to NY Penn Station, NYC Port Authority Bus Terminal, Empire State Building, Madison Square Garden, Times Square, Javits Center, B&H Photo & Video, Grand Central Terminal, Cruise Ship Terminals, Sightseeing pick-up areas, Midtown Hotels, Museums, Restaurants, Shopping Areas and more. Daily Luggage Storage: $8 to $10 a day -- store more than 3 bags and get up to 30%. off. Monthly Luggage Storage / Lockers: $3 to $5 a day per Luggage or Locker... compared to others - Airports, Hotels etc - where you pay $10 to $16 per day for the same service (no monthly rates available), and we are conveniently located in the heart of Manhattan... WOW. Note: Open all upcoming holidays at both locations. Just Show Us Some Proof That You Are Going To The Show And Get 10% 0ff At 357 w 37th St Our Main Location Which Is Located In The Garment District. Established in 2008, Schwartz Travel & Luggage Storage offers convenient daily storage for all types of people visiting New York City -- tourists, job-seekers, event-goers and anyone else looking for a simple way to keep personal items safe. Schwartz currently has two locations conveniently located in Midtown Manhattan near Penn Station, Grand Central Station, Times Square and other New York City landmarks. Most of Manhattan's finer hotels have a luggage storage room. If your hotel does not store luggage, you might ask the concierge of a nearby one that does. You might also find that a generous tip can possibly help find you a solution if the hotel clerk hasn't got an answer. However, less expensive hotels might not be of any help at all, at which point you need to consider other options. Although JFK airport does have two luggage storage facilities, unless you intend to fly into JFK and fly out again from JFK, it's a waste of your time to travel so far just to store your luggage. This service is most useful if you have just arrived after a long-haul international flight and have a day to spend before your onward connection. At the Terminal 4 Arrivals area, the facility operates 24 hours per day, and charges $4.00 to $16.00 per day depending on the size of your luggage. For more information, phone (718) 751-4020. The facility in Terminal 1, located near Alitalia and Olympic Airlines in the Arrivals area, operates from 7:00 AM to 11:00 PM, also charges $4.00 to $16.00 per day depending on the size of your luggage. For more information, phone (718) 751-2947. $10 per item per day. Plus get a FREE MAP!!! Looking for Film or Battery?